Imagine you are going to have a conversation with somebody about your future work together. You may be planning to talk to a friend, a work colleague, a customer, a team or your boss. But there is one difficulty. You are not exactly sure how you want to work with the person. 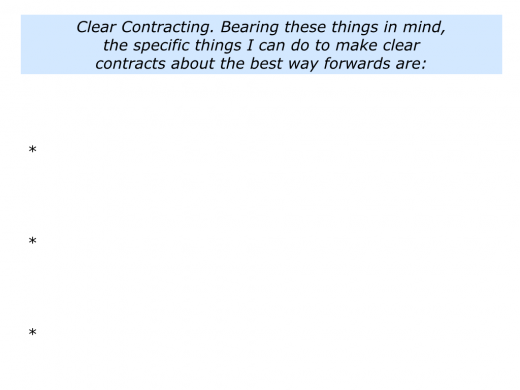 Let’s explore the steps you can take to make clear contracts. 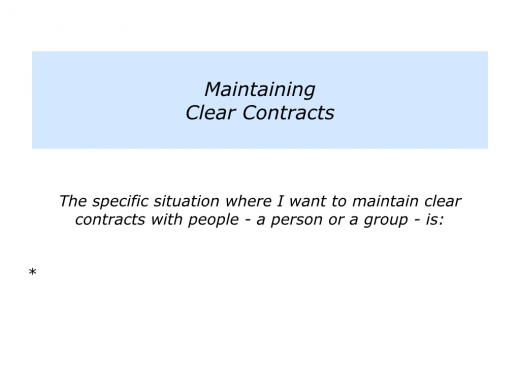 How can you clear contracts with people? The first step is to make a contract with yourself. It is vital to be clear on what you do and don’t want to do in a situation. This makes it simpler to make agreements with other people. Otherwise it can be easy to fall into a dialogue and stray far away from the things you really want to do. “Sometimes I emerge from meetings having committed to doing more work than I intended,” said one person. “Maybe it’s because I take on lots of responsibility, but I also find it hard to say ‘No’. How to make clear contracts with yourself? Let’s take the instance of people making New Year Resolutions. Many people say they want to embark on a new lifestyle, only to lapse into old habits after a short while. Peak performers, for example, make a clear contract with themselves before committing to working to achieve a goal. They often go through the following process. A person can clarify what they do and don’t want to do in, for example, a working relationship before embarking on the contracting process with other people. They can keep returning to this agreement with themselves when exploring the possible ways forward. Let’s look at how this works in practice. Dawn had been invited to apply for the leadership role in an organisation. She had her doubts, however, because the team was considered dysfunctional. At the same time, she saw it has an opportunity to do some pioneering work with customers. These could then be translated into success stories that would benefit the organisation. Dawn did her homework before the interview. She started by clarifying what she did and did not want to do in the leadership role. Below is an excerpt from her lists. Do pioneering work with customers and produce success stories that benefit the organisation. Build a team of self managing professionals who deliver outstanding work. Play to my own strengths – which are helping customers to succeed – and build a well-rounded leadership team. Proactively keep my managers and other stakeholders informed about the progress towards achieving the goals. Eventually coach my successor who can lead the team to achieving ongoing success. Spend lots of time trying to persuade unprofessional people to get onboard. I will give everybody a chance to commit. If they choose to remain unprofessional, I will get people who can deliver the goods. Exhaust myself in the process of leading the team. I will therefore aim to build a more self managing team. They can deliver today’s business, while I focus on shaping tomorrow’s business. Explain the specific results she would ensure the team delivered. This would reassure the stakeholders. Explain the early successes the team would deliver and how she would keep the stakeholders informed about the progress towards achieving the goals. Explain the principles she would follow to build the team to ensure it delivered success. She would give everybody a chance. She would, however, take whatever steps were required to build a professional team that made its best contribution to the organisation. Dawn was offered the role. The employers said that, whilst it was important to give everybody a chance, they understood it was vital to build a team of professionals. She made a success of the role. There was a tricky moment at one point when she aimed to replace a poor performer. At that stage, however, she replayed the original discussion with the employer. Dawn again outlined the principles that people needed to follow to deliver success for the organisation. She had tried many things to encourage the person in question to commit to behaving in a more professional way, but they refused. She had already got a replacement lined up, so the employers gave their backing. This proved a key turning point in the team’s fortunes. People saw that the new approach was for real. They went on to do superb work and deliver success. 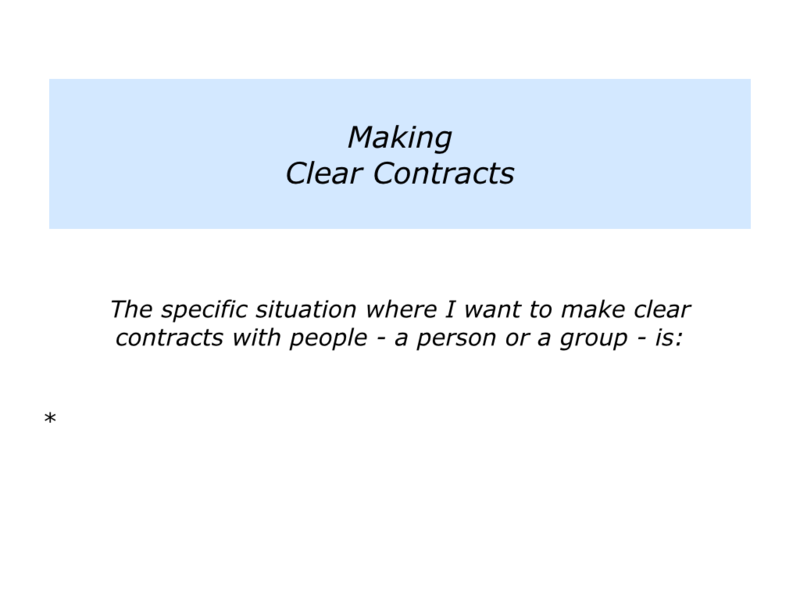 Imagine that you want to make clear contracts with somebody in your personal or professional life. Before the meeting, clarify the things you do and don’t want to do in the relationship. Looking at it from the other person’s point of view, it can also be useful to clarify what you believe they do and don’t want. You can then consider how it might be possible to get a win-win. 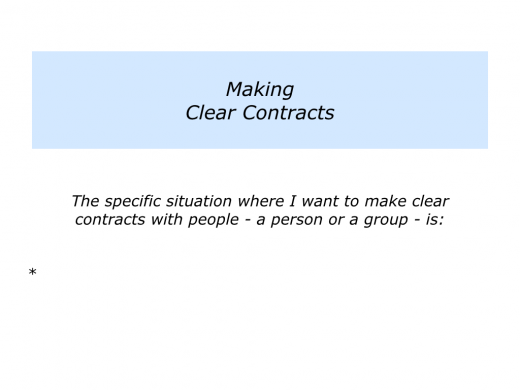 Describe a specific personal or professional situation where you want to make clear contracts with a person or a group of people. Describe the specific things that you do and don’t want to do in this relationship. Describe what you think the other party wants. 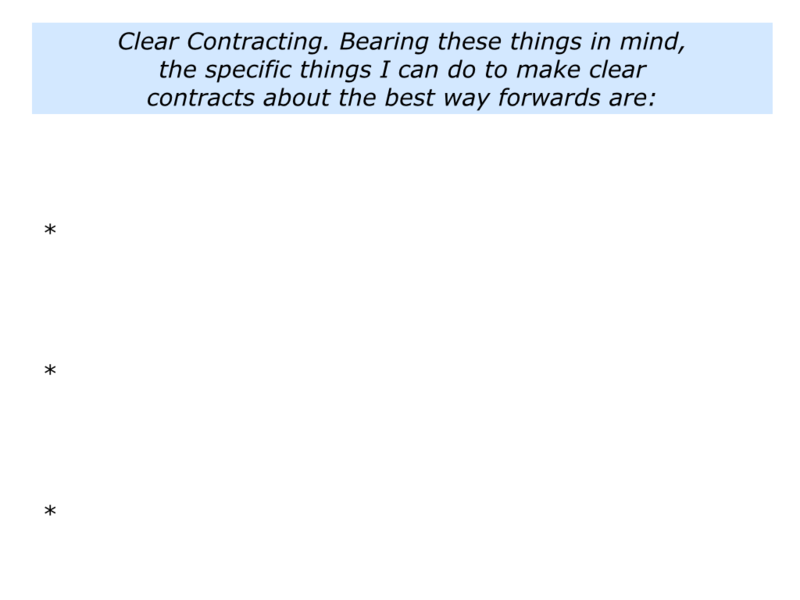 Describe the specific things you can do to make clear contracts about the best way forwards. Imagine that you have made a clear contract with yourself and other people. You may then want to keep checking how you and others are doing against the agreed contract. Some years ago I worked with a soccer manager. Two years previously he had been invited to manage a struggling club. The owners wanted him to save them from relegation and reduce the wage bill. The club would then be in a position to recruit new players and work towards winning a trophy. The manager had fulfilled his part of the bargain. The club had climbed the table and the costs had been reduced. When he asked about getting new players, however, the board would not give a straight answer. a) To continue working under the present conditions. b) To confront the board about the need for new players. c) To leave and take up a recent offer from another club. The manager had enjoyed the previous two years, however, and wanted to enjoy the fruits of these labours. At the same time, he wanted to stick to his principles. He did not want to become a victim. Bearing these things in mind, the manager decided to pursue the following strategy. Setting up a meeting with the owner, he went through the following steps. He thanked the owners for the opportunity to build the club. He briefly outlined the team’s achievements – and the budget reduction – over the past two years. He explained that he had been attracted to the club by the owner’s ambition to turn the club around and win a trophy. He wanted to know if this was still the club’s ambition. If so, he was sure the team would win a trophy if the club could find the funding for three key players. He explained that all managers say they want three more players but, in the case of this club, these players would make the difference. He would love to help the club to take this step and fulfil the original contract. The manager explained he simply wanted to clarify the situation. His preference was to stick to the original contract. If the contract had changed – and sometimes contracts do evolve – then it may be worth exploring other options. The owners reassured him that the club was still ambitious. Finances had become difficult, but there may be ways to get funding for two players. The owner’s found ways to buy two players the manager rated. He was also able to get another good player on loan. The club went on to win a national trophy. Sometimes things do not work out as well. Some boards would simply tell the manager to leave. The board of this club, however, had great integrity. The manager returned to the original contract he had made with both himself and the owners. Everybody then worked together to achieve the agreed picture of success. Imagine you have made such contracts with yourself and others. 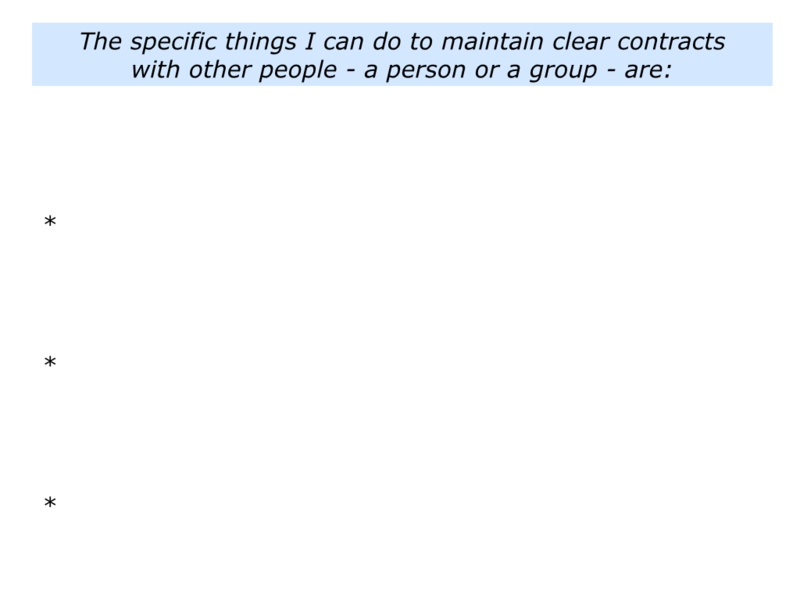 One scenario is that people fulfil the agreed contracts. Another scenario is that people fail to fulfil their parts or that events occur that mean the contracts may need to change. Bearing these things in mind, it can be useful. To keep focusing on the original agreed contract. To ensure that you and the other people follow the agreed contract. To, if needs must, meet with the other people to review any changed circumstances and, if you choose, to then make a new agreed contract. To keep working and fulfil the agreed contract. 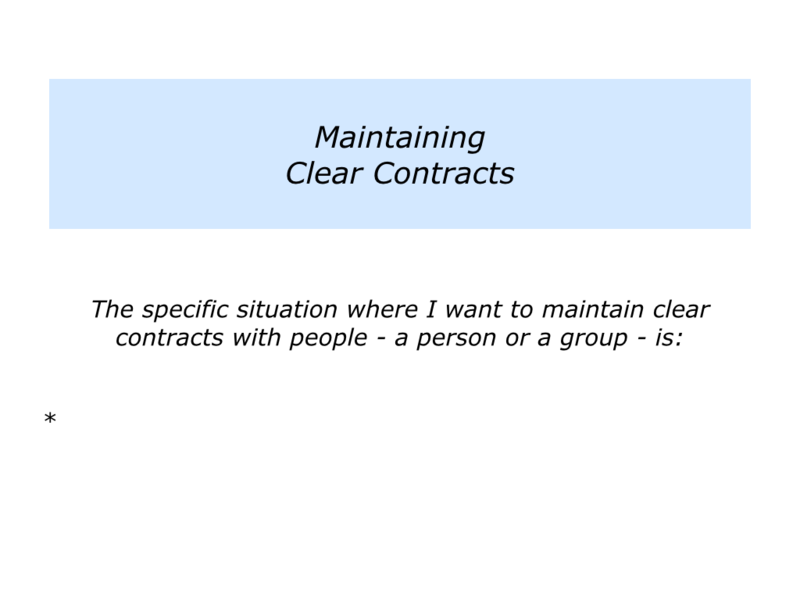 Describe a specific personal or professional situation where you want to maintain clear contracts with a person or a group of people. 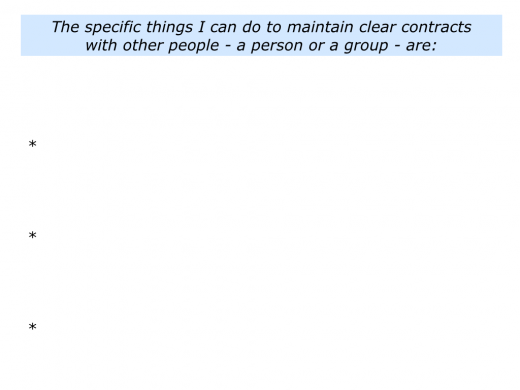 Describe the specific things that you can do to maintain the clear contracts with people. Describe the specific things you can do to, if appropriate because of changed circumstances, choose to make new agreed clear contracts. 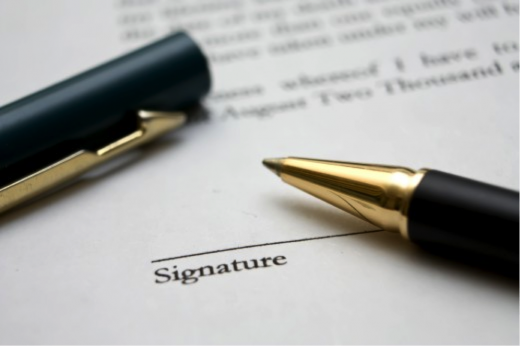 Describe the specific benefits of maintaining such agreed clear contracts.